I’m moving the comic to Sunday-only for two reasons. One, I feel like I’m spamming myself by posting comics three times a week. Two, the vast majority of comics generated by the script just aren’t funny. My code generates one comic every ten minutes, so over the course of a week that should be over 1000 comics to choose from. One of those has to be amusing. But three? Anyway, hipsters are always a good punching bag, even if they’re a bit past their humor sell-by date in 2013. The grody code at the beginning of Character 1’s speech balloon shows that my HTML filter isn’t quite catching everything the new Thingiverse throws out there, so I’ll do a little tweaking this week and take care of that. 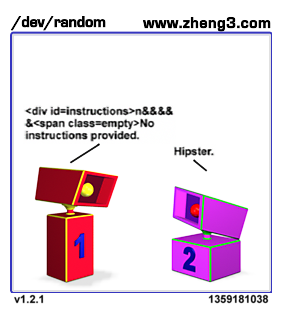 This entry was posted in /dev/random, FAIL and tagged comics, hipsters, nerd humor, python, robots, self-spamming, thingiverse on January 27, 2013 by zheng3. No more breakages when the page design changes!